I enjoy so many memories of university when I read Somerville Magazine from my college Somerville. 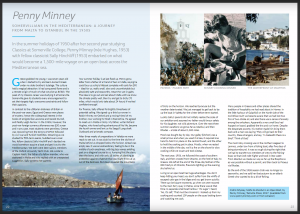 So I am very delighted and honoured that an article about my book of sailing adventures in the Mediterranean is featured in their 2017 Somerville Magazine, the Global Issue. Many thanks to the editor, Sarah Hughes (probably no relation!). Enthusiasts can read the article on page 22 here. Somerville was remarkable in that it gave us young women of the 1950s a strong sense that we could do anything and there were no barriers – war, danger, sexism, finance, storms – that could hold us back. 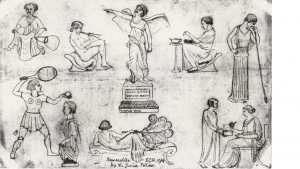 One of the strongest influences on myself and Sally was our tutor Isobel Henderson, a true pioneer of women in Classics. Isobel Henderson had been appointed tutor in Ancient History at Somerville and stayed for many years, inspiring generations of Classics students- and even warning some of them to be on their guard against the abuses of a famous male tutor. As we sailed the Greek Islands in Crab we tried to meet up with her several times and succeeded in July 1957, in Corfu, where she found our message at the Poste Restante and came to track us down in Krevatsoula, in the estate of Mme Theotakis. “Moment of dejection as I realised we both had a good coat of anti-fouling on ourselves, as well as on Crab. My friend Maggs was not quite so messy. How had Sally managed to get some of it even on her back? We explained that a boat has to be launched even before the antifouling has set hard, in a hot climate like Greece. “This wasn’t what I had expected. Two weeks earlier we two had received our Finals results – Sally a First, I a Two-One. Receiving them had marked the beginning of life as full adults: leaving the cocoon of Somerville College would surely put a subtle barrier between us and the denizens of that former life. As I submitted to having anti-fouling scrubbed off my back (apparently I had more even than Sally), I realised my Greats Tutor had never been what I expected. I still remember being sent to her for being caught climbing in to the college an hour after lock-up. Instead of lecturing us, she told us how she too had been caught climbing in. In her case she was the Somerville Junior Fellow. Returning from a fancy-dress party, to which she had gone dressed as a lobster, she found she had to make use of the route through the bathroom window of the College Dean, because the college gate was already locked. The Dean came into the bathroom through the door as she came in through the small window. After that she decided to live out, not in college. “Skin tingling from the scrubbing, we walked with Isobel and Honor round the curve of the bay to the bar at Dassia, where the nucleus of a prospective Club Mediterranee was being rapidly expanded, its assembly-kit Hawaiian-type huts multiplying by the day. “Sally and I had planned the feast together. We wanted to say thank you to Isobel for more than two years as our tutor, and particularly for the stimulus of her fortnightly teaching sessions at her house out in Park Town. There was still more: she had helped Sally apply for an Archaeological grant that would give her a year at the British School at Athens, and she had even found a slice of the grant for me. This was to fund me the following year to work on a site in Crete for 2 weeks, and then to research into ancient merchant shipping-routes as Sally’s second in command. Looking back I am thankful for a university education and inspiring tutors that made such a huge difference in my life. The influence of Isobel Henderson and other pioneer women in Classics stayed with us as we braved storms, murderers, being becalmed and a host of adventures and fascinating encounters in as our tiny open lifeboat, Crab, sailed us from Malta, past Sicily, around Italy, through Greek islands the Corinth Canal and all the way to Istanbul and the Bosporus. It is for the memory of Isobel Henderson as well as the huge impact my alma mater Somerville continues to have on so many lives that I am so very proud to feature in their alumni magazine. Sketches of members of Somerville Senior Common Room by brilliant junior fellow Isobel Henderson, 1934.